The GUE Fundamentals course is by far GUE’s most popular program. It functions as a gateway into GUE training and it is an excellent way to personally experience what GUE is all about. 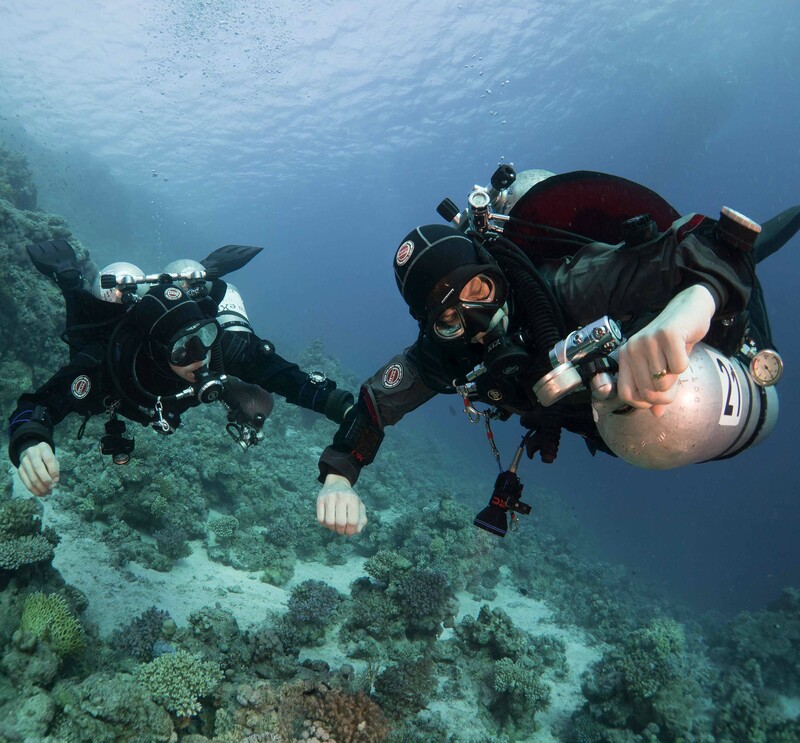 Some divers use the Fundamentals course as a way to improve on the less-than-optimal training they have received during traditional fast-track entry-level courses. Others see the course as a ticket to participate in GUE projects and activities. Many technical divers and even experienced instructors from other organizations use the course to improve basic skills and gain access to GUE’s cave and tech-training. It is not uncommon to have divers with very diverse backgrounds in the same class, which makes this course completely unique in the diving industry. Everybody will benefit, regardless of their current level of certification or experience. Graduating this course with a pass is something to be proud of, as the quality of a GUE Fundamentals diver is recognized all over the diving world. For many non-GUE divers, the Fundamentals course is an “aha!” moment where everything falls into place. The standardized equipment configuration and standardized procedures are only a small part of the big picture. Realizing how a team-oriented approach can free up resources and increase situational awareness that can be used to maximize safety, efficiency, and fun is often a life-changing moment for Fundamentals students, and they walk away from the course with a completely new approach to diving. Historically, the Fundamentals course was created to make sure that divers who showed up for more advanced training in GUE’s cave and tech courses were not struggling with basic diving skills. A solid diving platform is based on balance, trim, buoyancy and propulsion techniques. It is pointless to begin more advanced training before mastering these basic aspects of diving. It will only lead to over task loading, stress, and poorly-learned skills. 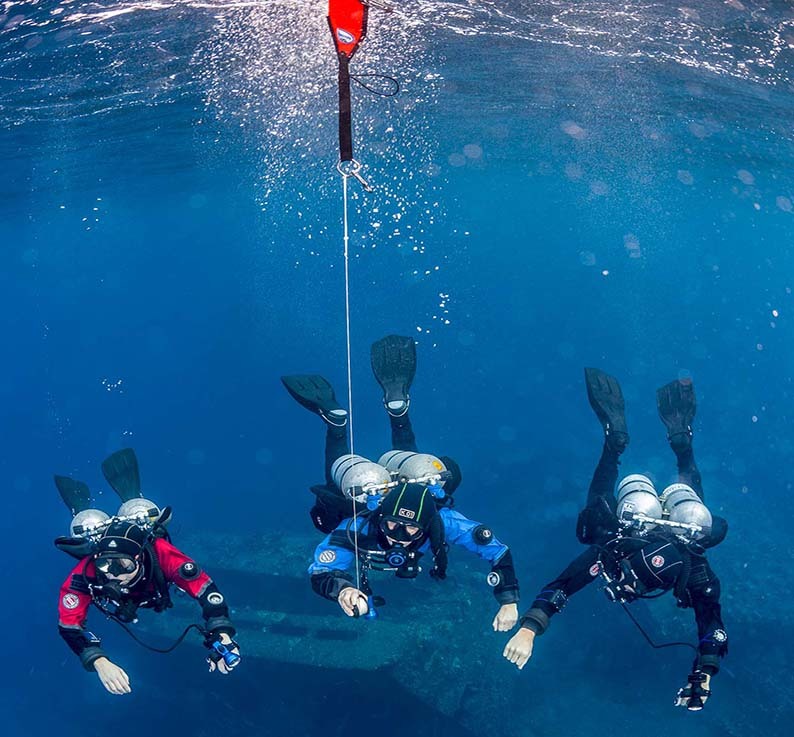 Divers who struggle with personal skills will not be able to contribute to the team, nor will they have the required level of situational awareness needed in cave or tech training. The GUE Fundamentals course provides all divers with an opportunity to advance basic diving skills. It provides the non-GUE trained divers (divers who are already certified with another recognized diving agency) with a gateway into GUE training. It is a prerequisite for all GUE courses (apart from entry-level courses, Drysuit and Doubles primers). Course outcomes include, but are not limited to: GUE equipment configuration and use, trim and buoyancy, propulsion techniques including backwards kick, valve management (the course can be done using a single tank or with a double tank configuration), gas sharing, and SMB deployment. This course will supplement training that divers may have already received and will give them more confidence in their basic skills even if they do not desire to go on for more advanced training. The course also includes the theory and use of nitrox. Passing GUE Fundamentals class opens up many paths for a certified diver. The recreational pass allows you to enroll in GUE advanced recreational classes and primers to enhance your fundamental skills from ascending control, rescue skills or managing additional dive gear and tasks. More training will increase your experience, confidence, and capacity that can lead to technical endorsement (equal to technical pass for Fundamentals) and progression to GUE technical or cave curricula. There is so much of the underwater world for you to explore. There are thousands of wrecks and reefs hidden at depths that you may not yet be able to reach without further training and experience. You can add more adventure to your dives and head deeper into the aquatic world by advancing your diving skills with the Recreational advanced courses - Recreational Diver 2 and Recreational Diver 3. You can add more adventure to your dives and head deeper into the aquatic world by advancing your diving skills with the GUE Recreational Diver 2 course. 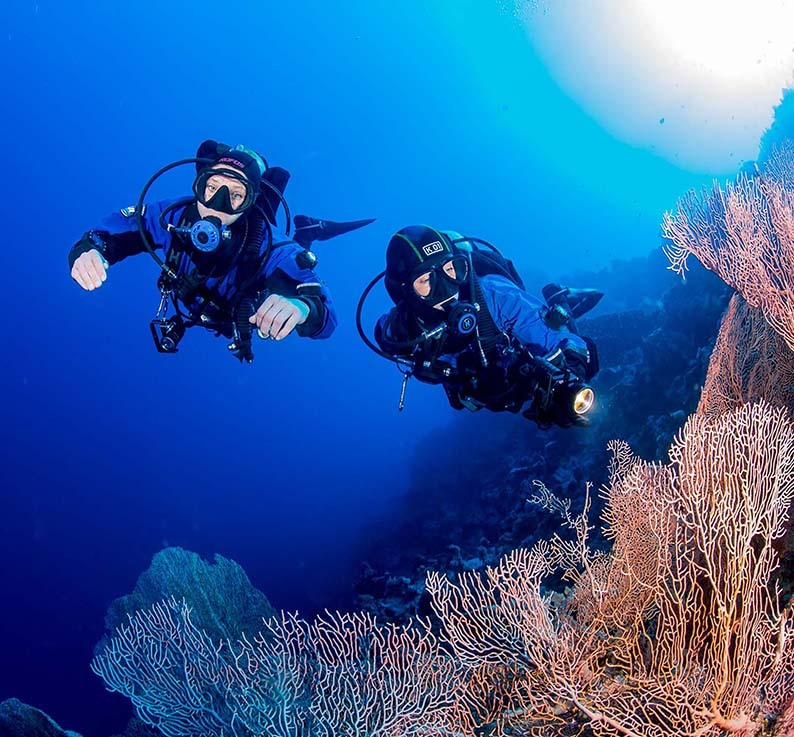 This course is structured to prepare divers for deeper recreational diving up to 100 ft/30 m. It teaches divers to navigate underwater and how to help a team member in distress while using efficient diving skills and advanced breathing mixtures, such as triox. 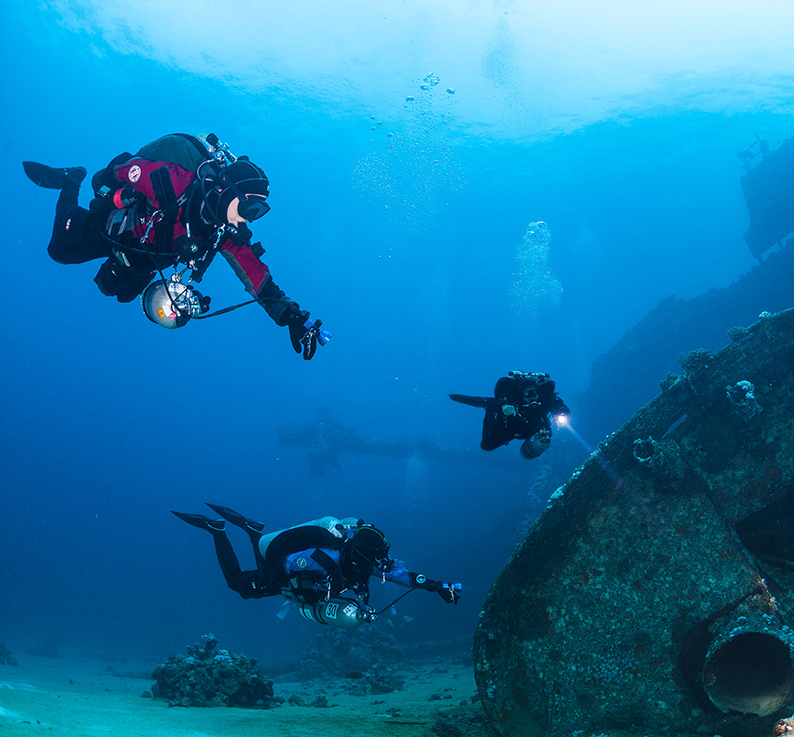 Reach your next diving goals by going to depths that require more skill and advanced breathing mixtures with the GUE Recreational Diver 3 course. This is a limited decompression course structured to teach advanced diving skills, prepare divers for utilizing decompression cylinders and double tanks, and to breathe helium-based breathing mixtures appropriate for deeper recreational diving to 39 m/130 ft. The GUE Cave Level 1 course provides an introduction to diving in an overhead environment. The fact that our environment is full of flooded underwater caves hidden from sight makes cave diving exciting and adventurous. 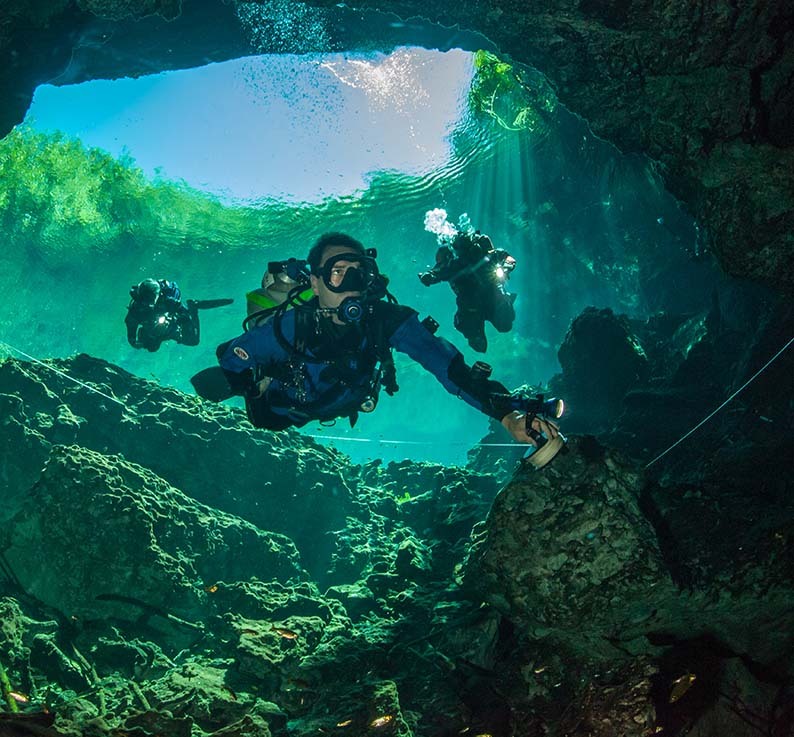 This unique environment requires proper training, and the GUE Cave 1 class provides divers with a thorough understanding of the cave environment as well as the potential dangers associated with cave diving.